As a consequence, fulfilling IT staff requirements is challenging at best. Human capital in the IT arena is integral to every aspect of the business. Without the right IT resources, businesses suffer from constraints in terms of the agility and flexibility needed to meet current and future needs in a constantly evolving digital business landscape. In order to help your business find the right personnel, here are five strategic staffing IT tips that can accelerate that journey. When it comes to IT staffing, it’s important to not only know what you need in a future IT staff member but be able to convey that to the prospective talent pool. It’s crucial for your organization to communicate what it can offer these candidates beyond a job description. That means being open about the technologies that they will be working with now, the types of projects in the pipeline, and any upcoming initiatives that are planned for the future. Sharing these details can attract the right talent and enable you to retain them once they are hired. Employers must look beyond the traditional staffing firms for their recruiting efforts. Hiring from a local college or university can be an ideal way to fill a more entry-level position. The trick is to look beyond just a degree and consider candidates’ personal experiences. Examples that show their commitment to learning or technology, such as outside courses, clubs, and hobbies, showcase their alignment with your present and future needs. Your business should also consider training people with transferable skills who can, for instance, learn a new computer language to meet the job requirements. Bringing interns into the organization is a perfect chance to determine a cultural fit and assess their ability to learn and adapt, as well as experience how they work with the existing team. Communication and problem-solving are equally important in most every IT role within a business. You must ask as many non-technical as technical questions to determine the soft skills of the candidate. Determine if he or she is a good communicator in addition to his or her IT proficiencies. This is also an opportunity to see how much he or she knows about your business and how IT intersects with business process needs. For the best IT staffing fit, intellectual curiosity is almost as important as existing skills. It’s important to look for candidates who want to learn more and who will be willing to pursue additional skill-building courses or certifications throughout the duration of their career. With today’s deadline-driven IT demands and time-compressed project cycles, the ability to augment a core IT staff with on-demand advanced-skills professionals can dramatically increase a company’s competitive advantage. The challenge is understanding when it’s best to begin outsourcing your IT staffing needs as the best way to augment existing IT staff. Key signs that indicate it’s time to outsource your IT needs include process slowdowns due to outdated hardware, lagging operating systems, and delayed repairs. While this may be symptomatic of a lack of dedicated IT budget, it may also be a sign of an IT team stretched too thin. Other signs may come from a lack of technological sophistication that enables the business to be agile in a competitive digital landscape. Current IT staff members may be IT generalists rather than needed IT specialists who have the certification, skills, and experience necessary to implement strategic IT solutions that can further business growth and streamline processes and costs. By having an external managed IT services partner to deal with day-to-day IT support, as well as long-term evolution, your organization can tap into highly skilled IT consultative support. The best of these managed IT services partners provide a broad and interconnected suite of services that are bolstered by an understanding of how to develop and fulfill a defined IT strategy that is aligned with business goals and culture. In the current market, there are more positions for IT professionals than there are experts to fill them. It’s important to have many sound strategies for finding the right people with the right skills at the right time. 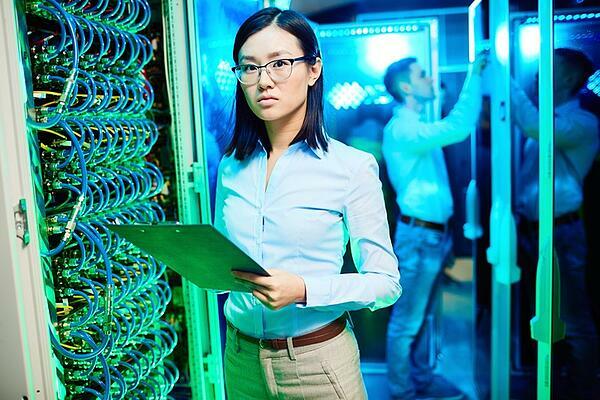 These five strategic IT staffing tips provide a foundation for innovative approaches and specific considerations that can enable your business to fulfill its IT needs in ways that foster agility, growth, and success.